To drive continuous improvements, VMI has developed the VMI Joiner: an unwinder unit with automatic joiner for cotton web. Placed in front of an ACE cotton pad punching and packaging machine, the VMI Joiner unwinds cotton web rolls and automatically connects them. The automatic splicing system requires fewer unscheduled stops as waiting time for connecting the rolls is reduced. 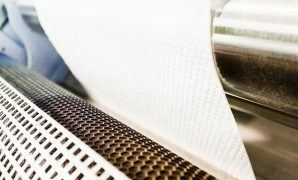 Moreover, the use of tape to connect the two cotton web rolls is no longer necessary, eliminating the risk of tape being accidentally included in the final product. The complete hands free process results in a further improved Overall Equipment Effectiveness (OEE). The ACE cotton pad punching and packaging machine can be equipped with the VMI Joiner un-winding system with automatic joining the cotton web. Two cotton web rolls are place on the VMI Joiner. The first roll is fed into the ACE. The end of the first roll will be detected and automatically connected to the second roll by the VMI Joiner. Your production is not interrupted by this process. 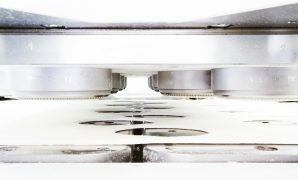 The automatic splicing system requires fewer unscheduled stops as there will be less waiting time for connecting the rolls.